The Next Big Move In Commodities? This obscure commodity index could well hold the key to identifying the next big directional move in commodities. After years of languishing, commodities have had a bit of a resurgence of late — or, at least a dead-cat bounce. Using the CRB Index as a measuring stick, commodities recently broke out to 3-year highs. Of course, with oil accounting for a 23% weighting in the CRB, recent new highs may be as an undue result of a rally in oil prices. 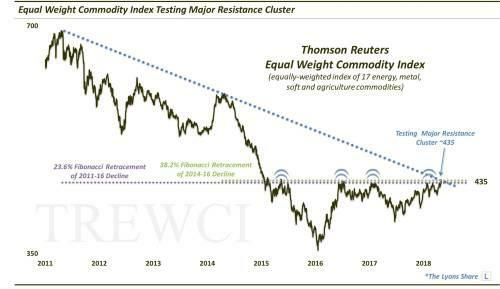 In our view, there is a better measuring stick for the overall commodity complex: the Thomson Reuters Equal Weight Commodity Index (EWCI). The EWCI measures the performance of the following 17 commodities, on an equally-weighted basis: Cocoa, Coffee, Copper, Corn, Soybeans, Cotton, Crude Oil, Gold, Heating Oil, Lean Hogs, Live Cattle, Natural Gas, Platinum, Silver, Soy Oil, Sugar and Wheat. Thus, unlike a composite like the CRB Index, the EWCI’s fate is not unduly tied to just one or a few commodities like crude. Rather, it is more representative of the broad commodity class. And at the moment, the EWCI is at an important juncture — at which its reaction could go a long way toward determining the next big directional move in commodities. Furthermore, the EWCI has been rejected at this level roughly a half dozen times in the past 3 years. Needless to say, this level presents formidable potential resistance for the broad commodity rally. That said, here’s a little secret: sometimes when an abundance of resistance (or support) lines align at the same level, it is actually easier for prices to penetrate it. Why, probably because there is just one level to break through rather than a series of potential obstacles. Whatever the reason, if the EWCI is able to penetrate this 435 level decisively, it opens the door to a further rise toward the mid-480’s, or about another 10%. 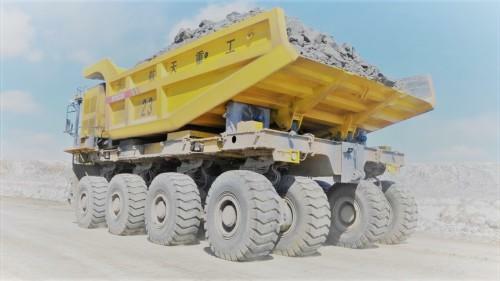 Thus, we will be inclined to add broad commodity exposure through a broad-ranging ETP. Here are a few options: GCC, GSG, DBC or DJP. Of course, should the index fail here, or quickly fall back below following a breakout, we would stay away. If you’re interested in the “all-access” version of our charts and research, please check out our new site, The Lyons Share. You can follow our investment process and posture every day — including insights into what we’re looking to buy and sell and when.